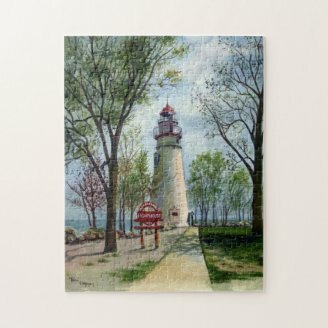 Lighthouses are fascinating and working a jigsaw puzzle is a relaxing and absorbing pastime. 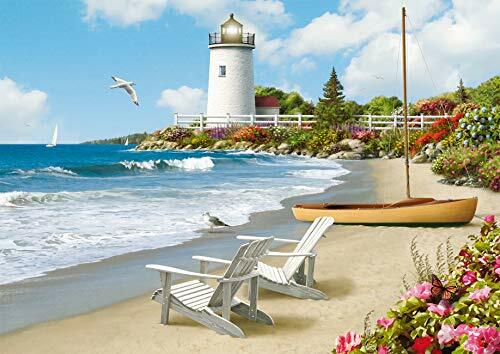 Here's a thought: Put the two together and work a lighthouse jigsaw puzzle. When was the last time you worked a jigsaw puzzle? Remember how much fun it was? 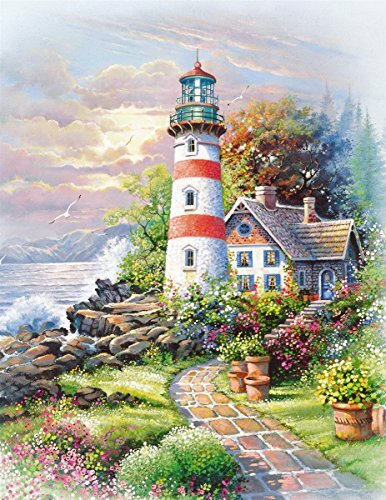 Maybe it's time to start on a new one - maybe a lighthouse puzzle is just what you need today! 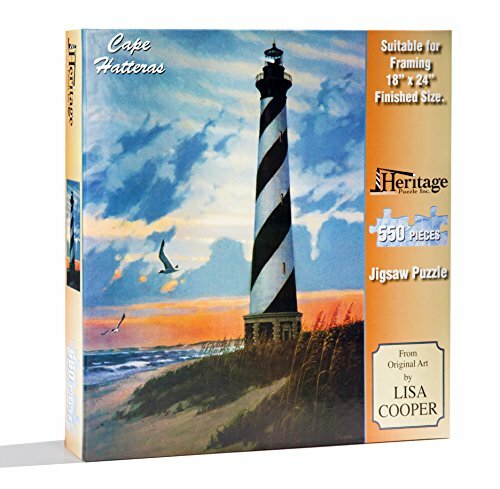 Since I love anything nautical, I've organized a nice selection of puzzles with lighthouses here, grouped by 300 (or fewer) pieces, 500 - 600 piece puzzles, and some nice 1,000 piece lighthouse puzzles. Not only is it enjoyable to work on a jigsaw puzzle, it may even be good for you. Puzzling helps younger children develop manual dexterity. Older children benefit by sharpening problem solving skills and thought processes involving spacial relationships. Some adults find working jigsaw puzzles to be a good form of stress relief. Family time is enhanced by things like jigsaw puzzles that can be worked on together. It's even suggested been that working puzzles, including crossword puzzles and jigsaw puzzles may aid in keeping older minds sharp, possibly even delaying the onset of senility. So, you see - not only are jigsaw puzzles NOT a waste of time, they may actually add to your quality of life, no matter what age you are! 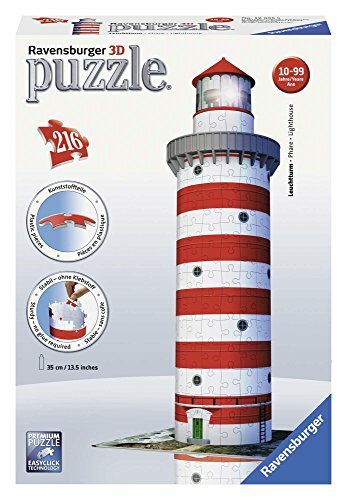 This is a 3-D lighthouse that's built with puzzle pieces that interlock like the pieces in a traditional flat jigsaw puzzle. The pieces themselves are flat where they need to be, and curved where they need to be. When finished, the lighthouse stays together without glue. 2 - The state of Michigan, which isn't anywhere near an ocean, has more lighthouses than any other state. 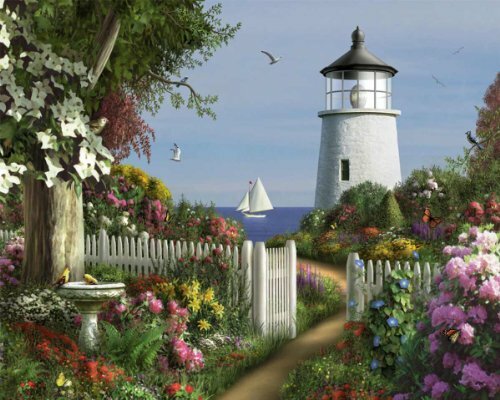 3 - The first lighthouse built on U.S. soil was the Boston Light, erected in 1716, on Little Brewster Island. 4 - The oldest U.S. lighthouse that has never been rebuilt is the Sandy Hook Light, in New Jersey. It was built in 1764, and the original structure is still in use. 5 - The Cape Hatteras Light, on North Carolina's Outer Banks, is the tallest lighthouse in the country. Standing 193 feet, it guards a part of the ocean where so many ships have wrecked that the area is known as the "Graveyard of the Atlantic." 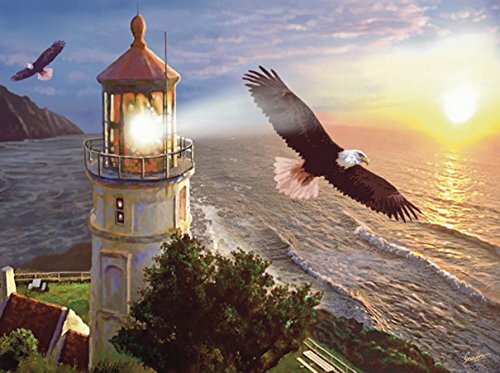 6 - Are there any manned lighthouses in the United States? Not unless you count the tour guides at the Boston Light, who are sometimes referred to as "volunteer keepers." The light was officially manned by the Coast Guard until 1998. Image: Eagle Harbor Light, Michigan, P.D. 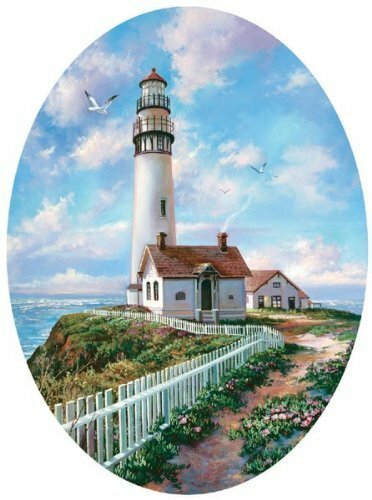 These lighthouse puzzles with 500 to 600 pieces make good gifts for older teens. They're not quite as daunting as the ones with a thousand or more parts, yet they're challenging enough to keep a bright teen busy. A 500 piece puzzle is also a good idea for a family activity for the family who has not worked a puzzle together as a family before. If you don't have a table to leave a puzzle out on for the time it might take to work a more difficult one, then consider one with 500, rather than 1000 or more pieces. Have You Worked a Jigsaw Puzzle Recently? 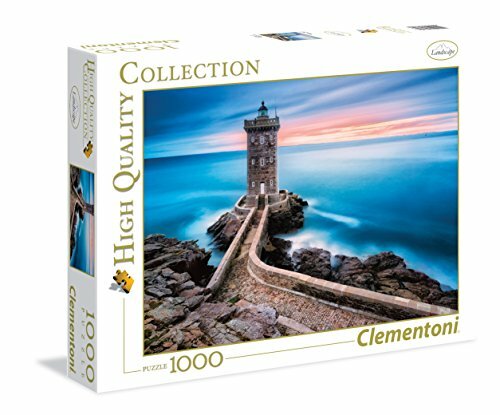 A 1000 piece jigsaw puzzle provides a wonderful on-going activity for the whole family. Everyone from about age 9 or 10 can help with one of these. Our family works one every year, when the whole family gathers for a reunion week. My beautiful daughter-in-law always brings along a 1000 piece jigsaw puzzle. We set aside a table in one corner of the large gathering room for working on it, and it stays there all week. Each person works on it whenever the mood strikes them, and there's almost always someone at the "puzzle table," whether it's a tween, a great granny, or someone in between. It turns into a family challenge to finish putting it together within the week. Only once did we fail to finish one. That was the year my daughter in law brought a 1500 one. The first National Puzzle Day in the United States was in 1995. It won't surprise you to learn that it was the brainchild of someone at one of the big game companies. In 2004, the day went international, and has been 'celebrated' on the 29th of January ever since. It celebrates puzzling of all sorts, including crosswords, jigsaws, brain teasers, logic puzzles and other like pursuits. It's a good day to work or give a puzzle. Simply work your puzzle ON the mat. When you need to clear the table, or want to take your puzzle somewhere, just roll up and secure the mat. You can then store or transport your work n progress. When you are ready to do a little more puzzling, just unroll the mat, and presto! You're ready to resume where you left off. 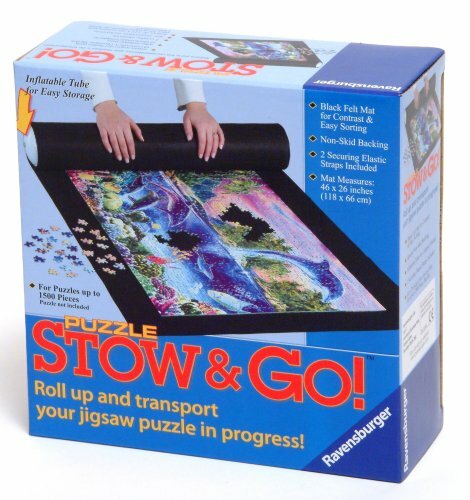 Every jigsaw puzzle lover should have one of these for their latest unfinished masterpiece. This particular one will accommodate puzzles of up to 1500 pieces. 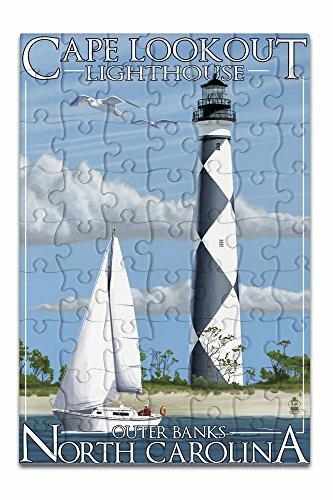 Is a Great Gift Idea for a Puzzle Lover! What do you think about this past time? CruiseReady, Does the stow & go work because of an adhesive surface? Have you seen the film The Accountant? The movie shows Ben Affleck's character as a young boy putting a puzzle together by the backs of the pieces! It's also a fun family activity. We all enjoy our yearly puzzling project at our annual family week. I have worked on jigsaw puzzles with little kids, but almost never have worked on one myself. I can see how a puzzle would help with developing a spatial sense. 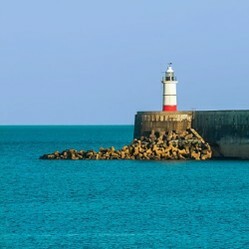 Young children can learn valuable lessons from books about lighthouses for kids. The Little Red Lighthouse is one such book, perhaps the very best one ever.